Mercedes-Benz has just revealed that its 2015 offering will pack some smartphone connectivity that attempts to make urban life on four wheels more pleasant. 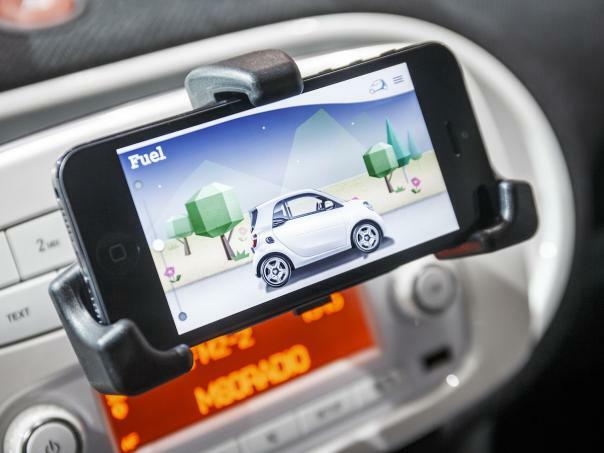 A new app, named Cross Connect, gives owners of the new Smart ForTwo – and the four-door ForFour model – access to a number of smartphone features on the move. Smart parking is among the features which now offer a more user-friendly design and incorporate new functions: the smart driver is not only able to save a parking facility but can also recommend it to the community, rate it and upload pictures. Owners simply download the app to their Android or iOS devices, attach it to the adjustable cradle and sync to the built-in audio system. Once Cross Connect is fired up, drivers simply swipe to the community menu and let the app discover the closest available parking spaces, many of which are only suitable for the miniscule dimensions of the Smart car. Driving score: around 180 facts and figures are automatically transferred from the smart to the smartphone. They provide information about the driver’s mobility behaviour in an entertaining way. Efficient driving is rewarded in the “driving score”. The Smart-owning community can also upload suitable spaces with ease by snapping an image of said spot and registering the GPS co-ordinates with a click of a button. Smart’s infotainment designers claim the community will help create a detailed database of Smart-sized parking spaces, some of which will be free of charge, across the world. Naturally, there’s a team of people sat in an office somewhere checking that miscreants aren’t uploading images of discarded crisp packets and claiming they are suitable for housing a Smart car. But once the sport is verified, owners can locate the nearest space and have the navigation system direct to the destination with the minimum of fuss.